Rughooking is a technique easily learned, leading to opportunities to master the materials, various techniques and design elements with practice – one loop at a time. 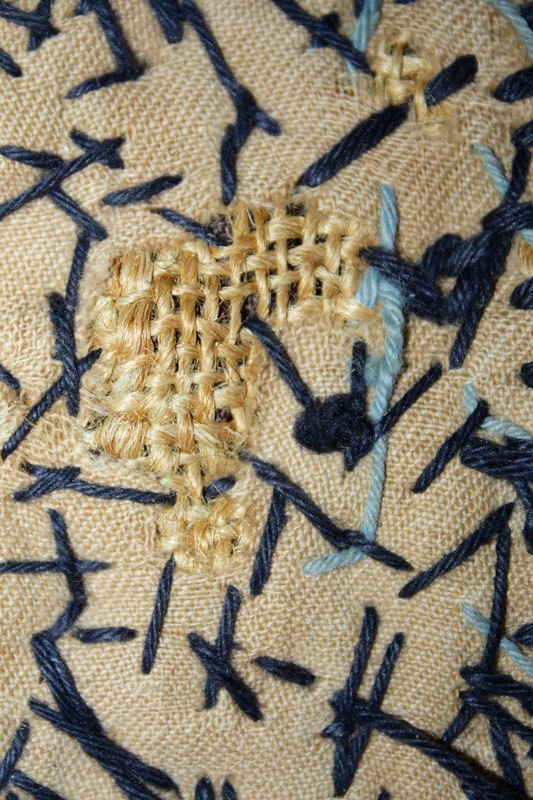 With the method comes a connection to generations of people who enhanced their surroundings creating utilitarian rugs from material once part of a garment or blanket. Each of these aspects drew me in and comforted me as I developed confidence as an artist. 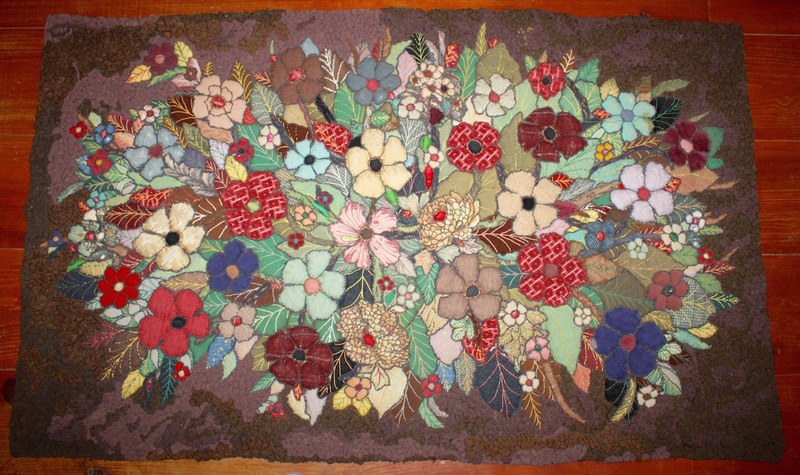 At least half a dozen years ago I saw a large tapestry on permanent display in the Legacy of Craftsmanship Room at the State Museum, Charleston, WV with a label describing the techniques as embroidery, appliqué and hooking. 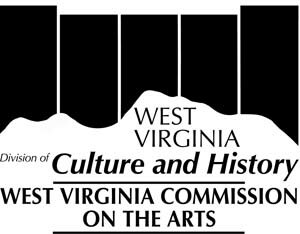 How exciting to know the same technique I was immersing my time and skills in had been recognized by the state of West Virginia arts commission. At the Appalachian Corridor Exhibition of 1968 (first of three bi-ennials under that name) a purchase award to Blanche and Otha McDonald for their rug was issued along with several other media. These first art pieces entered the collection housed at the State Museum and are now joined, over the past 40 years, by a couple of hundred contemporary art pieces thanks to the Bi-Ennial Juried Exhibition conducted by the Commission on the Arts, Division of Culture and History. 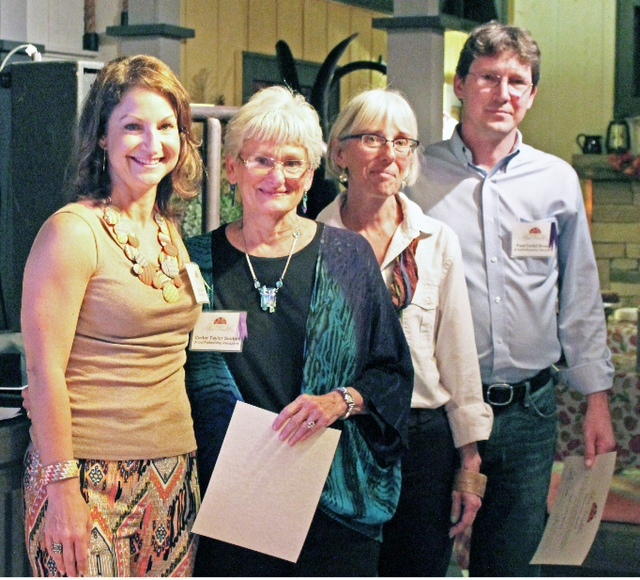 On Sunday, November 12, 2017 ten more works were awarded purchase recognition. 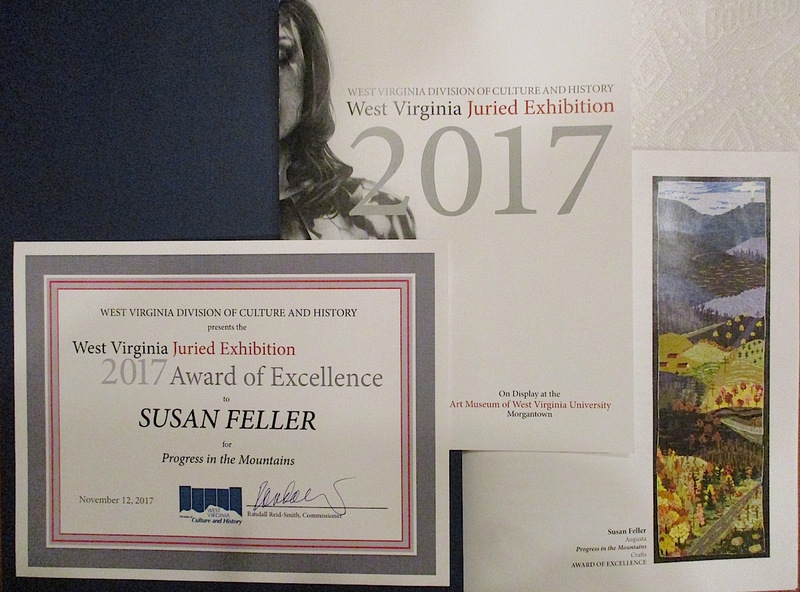 I am thrilled to announce there is another hooked piece in the permanent collection: Progress in the Mountains, Susan L Feller, Augusta, WV. The exhibit is on public display through February 11 at the Art Museum of WVU, One Fine Arts Drive, Morgantown, WV. The award winners will next be displayed at the State Museum gallery and then become part of the archives. 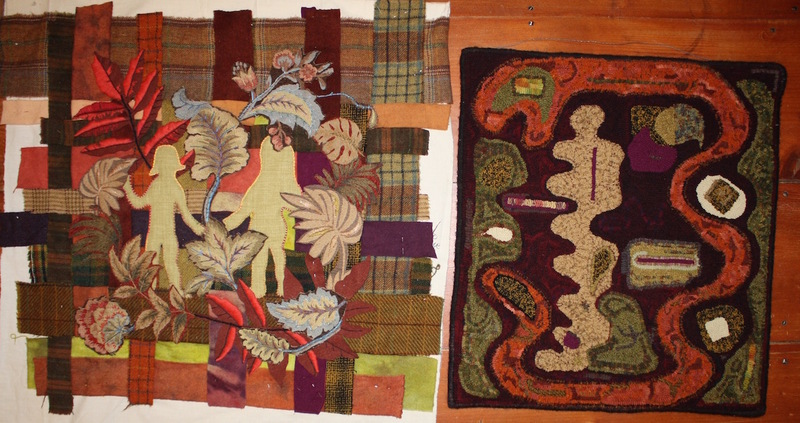 Just think 50 years from now someone will research the collection to find and study my hooked runner for materials, techniques of dyeing and hooking, and respond to my design just as I did the rug from 1968. One difference is I have documented my process, written articles, continue to record and publish the tools and materials I use and contribute these to the archives at the Museum. The McDonald Sisters work does not have these answers compiled as conveniently for research. A lesson I learned to rectify because of my frustration after seeing that rug and label on display and asking who were these ladies? Why did they mimic rughooking with their needle, thread and fabric strips? What inspired their designs and development of product? It seems I can now say I too am part of the generations of rughooking craft makers. And that makes me happy pulling new loops. This entry was posted in elements and design in art, Fiber Musings, juried art exhibit, juried exhibits, McDonald Sisters, textile art, West Virginia Artists and tagged Art Museum of WVU, fiber artists, hooked rugs, juried fine craft, Rug Hooking Magazine, Susan L. Feller, west virginia, West Virginia Culture and History on November 13, 2017 by Susan L. Feller. 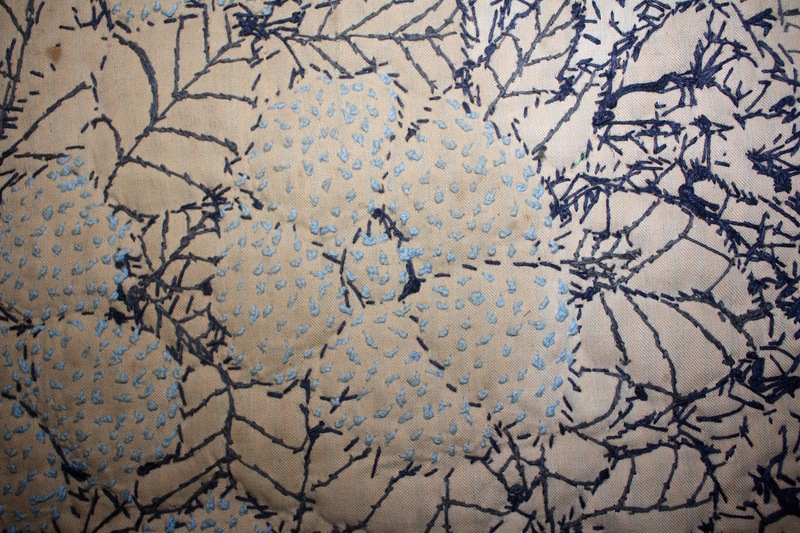 I learned an artistic textile technique, rughooking, in 1994 and stepped into the pattern making (line drawings) by interpreting traditional folk motifs on frakturs. In other words using someone else’s visual design (centuries old and out of copyright infringement) and composing with an expected balance. I mastered skills, materials and tools and became proficient in the craft. By 1999 I wanted to grow into my own style and enrolled in a workshop “Balancing Act” lead by Rae Harrell at Green Mountain Rug Hooking Guild in Shelburne, VT. With an open mind and no planning lines were directly drawn on the foundation material, my colors selected from a comfort pile and friends contributions, and I began to hook breaking “rules” I did not even know I had adhered to when I saw others using different widths of strips in one piece! 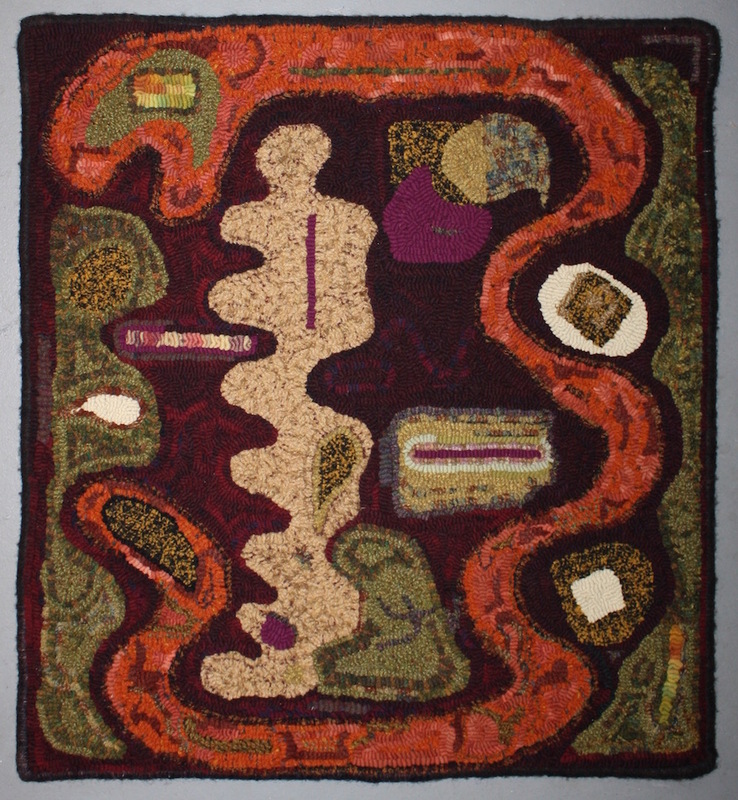 The result was Adam and Eve, completed in 2000 and juried by Mary Sheppard Burton into an exhibit Hooked Art in the 21st Century at the Textile Center, Minneapolis, MN. I have continued this journey making patterns and more regularly creating artwork depicting the natural wonder around me in West Virginia, and communicating social and economic issues. All the while a panel hung in the studio labeled “work in progress-Adam and Eve weave”. 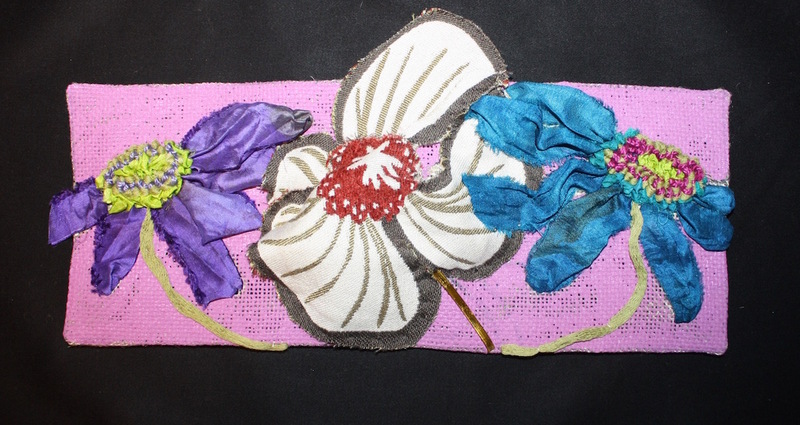 I had pinned onto muslin strips of the fabrics used to hook Adam and Eve with intentions to stabilize them either subtly or with embroidery stitches and attach to the hooked piece creating a large pillow (22 x 24). 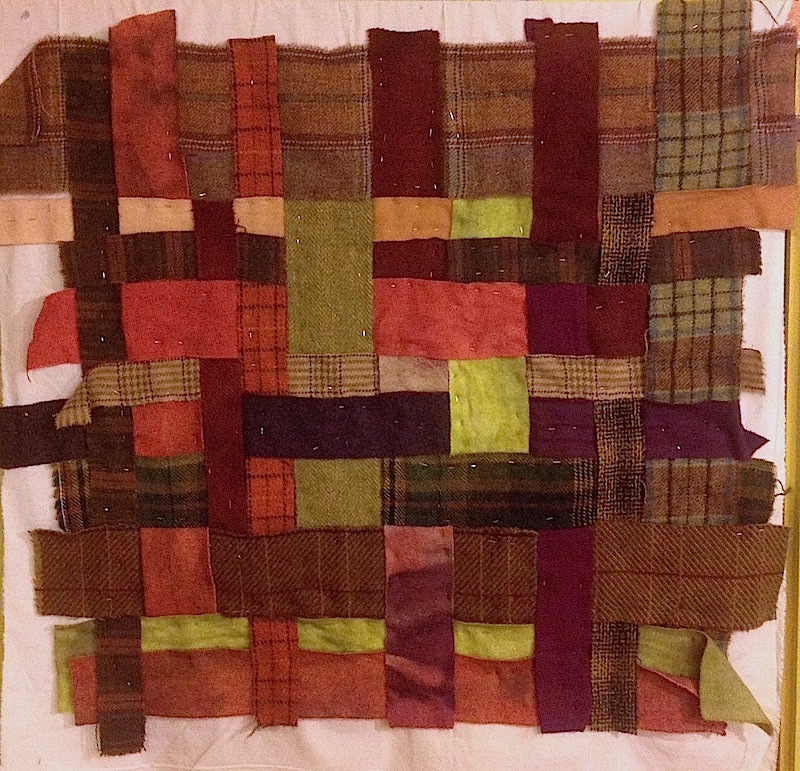 A year of exploring past and new skills (Year Study), five years researching textile craftsmen from West Virginia (McDonalds), a source for discontinued upholstery samples and a conscious pull back to slow stitching with thrums from weaver Wendy Clark I finally felt it was the right time. I enjoy composing, selecting materials and techniques each step interacting with the others until work can begin. There is a point of frustration when an idea can not be accomplished with existing materials or skills ….. the hunt for those takes away from the creative process but is essential if the work is going to be great instead of just good. I always have too many ingredients and need to simplify too. 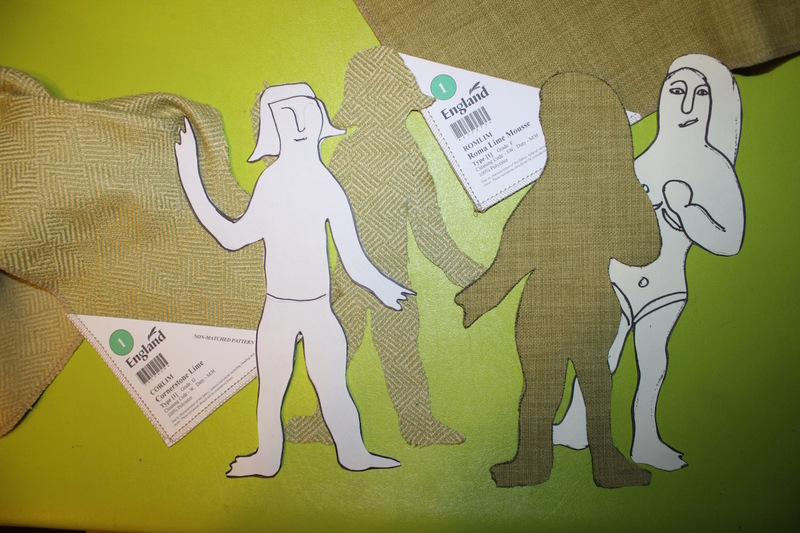 The two figures came out of my Design in a Box-Frakturs. 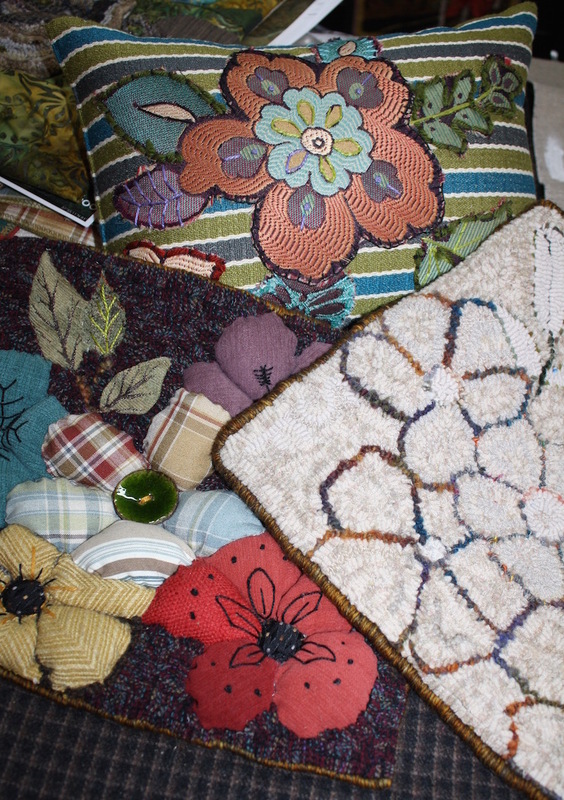 Until the organic leaf with blue color upholstery was added, my design was ok but too equal in values, shapes and colors. I decided the figures did not need to have facial details for us to know who they were. By us looking at their backs and the plants layered over the bodies the title made sense. They are going into the garden where the serpent rises up on the hooked side. The tools needed were simple: embroidery needle, threads, sharp scissors, and a few embroidery stitches from my past (satin, long and short, and back stitching) with my studio frame by Townsend Industries and Bob the supervising cat. By stretching the piece on a 14″ square frame I often used the left hand as precisely as my dominant right one. I involved people in the process using Instagram and Facebook postings (the images show my left hand holding tools often staged for the shot). Construction problems needed to be solved: selecting and installing a zipper (pillow form needs to be pulled out for transporting shell to workshops), anchoring edge with layers of wool and muslin and eliminating bulk for pillow, hand stitching two together when one was slightly larger than the other (measured but design grew, wool is a flexible material) but it all came together on January 16, 2017. 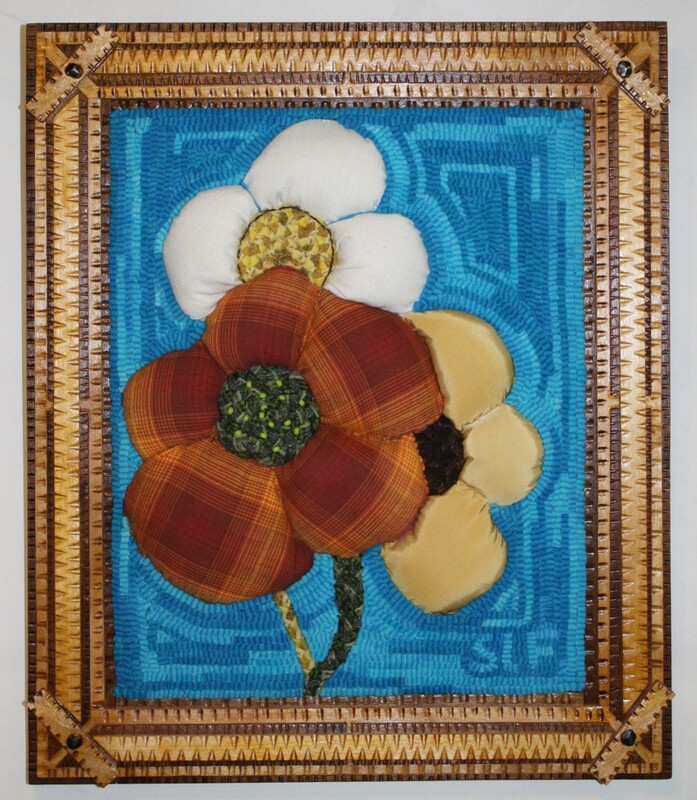 This entry was posted in elements and design in art, Fiber Musings, Fraktur Design, hooked rugs, McDonald Sisters, travel, West Virginia Artists and tagged fiber artists, frakturs, hooked rugs, Susan Feller, Susan L. Feller, Textile Center Minneapolis on January 18, 2017 by Susan L. Feller. It’s time to look back, review, evaluate and gather inspiration from the people, places and things on my journey of 2016. With students and friends while gathering for a few days of immersion in our mutual interests…fiber arts on the Puget Sound, retreating in Hampshire County WV and South Carolina, teaching in Maryland and Ohio at Sauder Village and lectures at Schwenkfelder Library, Pennsburg PA inspired me as much as my encouraging their design skills. Working with Alissa Novoselick and Emma Pepper developing an arts conference in WV; participating in an exhibit curated by Roslyn Logsdon in Maryland; promoting the McDonald Sisters of Gilmer County to thousands; and handing off a legacy to Green Mountain Hooked Rugs exposed me to new skills and supportive people. Big city Seattle, arts filled Asheville, rural Summerville Georgia, Thomas, WV population 600 and the beauty of nature along trails in Fayetteville, Seneca Rocks, and Harpers Ferry are places remembered in my sketch books and beginning to appear in fibers. 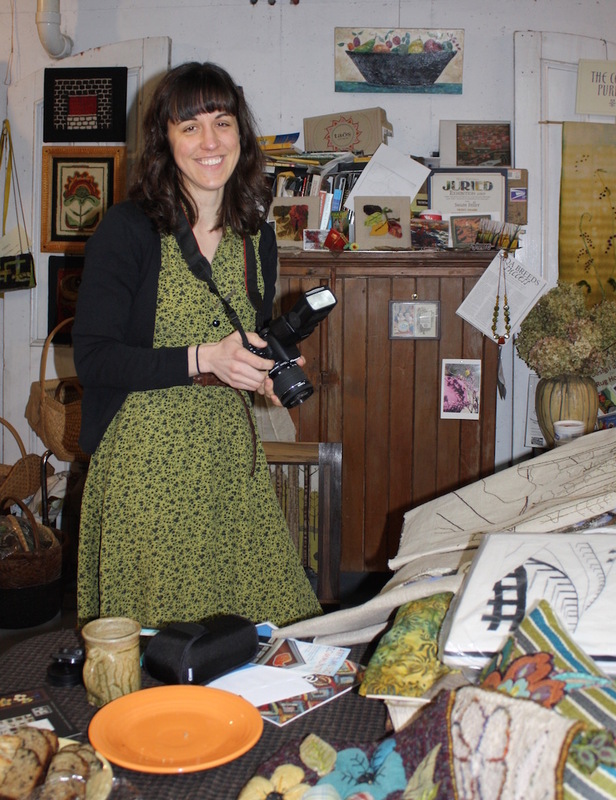 We gather objects to remember places and people especially collecting them from fellow artists. I like to wear jewelry made by artist friends when traveling, it is as much of an ambassador as I am. We often photograph our flowers in the art vases, new artwork hanging on log walls, and even show great food on our trips sharing our experiences with an “extended family”. Thank you to Kate Harward, Ginger Danz, Christine Keller, Norma Acord, Donald Stone, Wendy Clark, Rebecca Wudarski, Mountain Daughter Metalworks, Bruce Wilson and Marilyn Bottjer for your talent we live with daily. I am planning to explore places, interact with friends and react to artwork daily in 2017, perhaps we will meet up on our journeys and share some experiences. 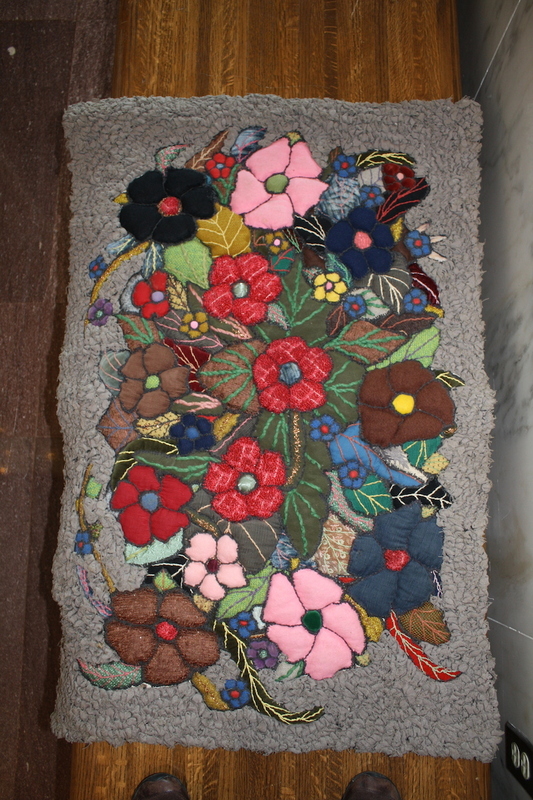 This entry was posted in elements and design in art, Fiber Musings, McDonald Sisters, rug hooking workshop, textile art, travel, West Virginia Artists, Workshops, Year Study and tagged fiber artists, Roslyn Logsdon, Sauder Village, Schwenkfelder Library and Heritage Center, Susan L. Feller, Tamarack on December 18, 2016 by Susan L. Feller.